when the antlers released burst apart three years ago, it was clear that the album constituted a make-it-or-break it scenario for the band; their 2009 album hospice, the brooklyn trio’s debut effort as a collaborative project, received immediate, almost unanimous universal acclaim and catapulted the antlers into the indie spotlight. luckily, burst apart was a suitable follow-up and a substantial success in its own right, but frontman peter silberman still finds himself confronted with inquiries about hospice, more than five years after the album’s release. although there are those who still can’t let go of the past, silberman certainly isn’t one of them. the antlers’ newest effort, familiars, is a lush musical experience that all but abandons the outfit’s signature heartbreak. while silberman is the face and the voice of the antlers (after all, it was his initial solo project and his emotive metaphor that began to turn heads), familiars is an environment that finds all three members contributing equally. a large portion of musical direction seems to come from darby cicci, the multi-instrumentalist responsible for much of the texture on the album. previously confined to a primary role of keyboardist and an explicit secondary exploration of trumpet, cicci has full reign on familiars; many songs have a foundation of acoustic piano, layered trumpet, and michael lerner’s drums, further augmented by extremely prominent bass lines (also courtesy of cicci) that slither throughout the chord progressions and give the antlers’ sonic palate a more organic low end. instead of silberman’s guitar largely defining the album like it did on hospice and, to a lesser extent, on burst apart, the instrument has the chordal support of the piano and the occasional melodic support of the trumpet, making the moments where it truly separates from the texture that much more meaningful. take “director,” the album’s centerpiece, for example: although the ostinato guitar riff is arguably a staple of the song, the instrument doesn’t really begin to take control until the descending riff and subsequent counter-melody kick in halfway through. underneath is that warm palate, full of drums and resonant bass that, although devoid of the trumpet in this particular instance, help the antlers firmly place a foot in the realm of jazz that has so long been an influence. though a musical liberation of sorts for the antlers is present, silberman’s lyrical and vocal progressions are less discernible, relying even more so on subtle nuances. his falsetto lamentations are still there, but silberman showcases a desire to return to his natural range, even dipping into lower, haunting extremes on “doppelganger.” lyrically, he’s more of a wildcard; “hotel” is extremely sparse yet somewhat confessional, as silberman admits “i rent a blank room to stop living in my past self,” while “parade” traces a more narrative style and lacks any type of hook. one constant that remains throughout is a sense of ambiguity, as silberman seems to strive less to attach an explicit meaning to each song and instead explore more inclusive, multi-dimensional emotions. familiars is nearly an hour of slow-burning which may inevitably put listeners into two broad camps: those that dismiss the album due to a perceived sense of stagnancy and those that appreciate it for its nuances and painstaking attention to detail. the latter of these two camps is the best lens through which to view this album. 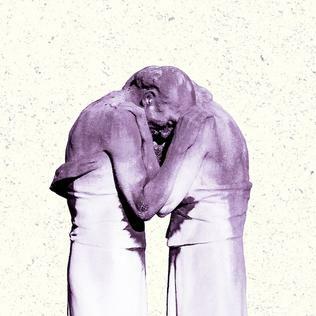 the antlers continue to expound and expand an incredibly complex and dense aesthetic, and provide another body of work that demands to be addressed before the reminiscing can begin.